Fighting A New Type of War – Cyber! At its simplest, Managed IT is the practice of outsourcing technology management to a third party, with the business goal of simplifying IT operations and reducing costs. Many businesses face the common challenge of trying to keep up with fast changing technology in order to successfully grow and stay competitive. Even if the company has internal IT staff, they are often overwhelmed with just trying to keep up with daily maintenance and end user support, let alone become experts in the latest and greatest. Business and technology are now indivisible. There isn’t an organization out there that doesn’t completely depend on effective and efficient IT to power their business, including yours. Companies in almost all industries are being seriously impacted by the innovative use of new technologies. A recent survey of company boards in the U.S. show that although they understand that technology is mission-critical to the survival of their business, there is a deficiency in suitably skilled executives who understand how to leverage technology advancements. It’s become critical for everyone who owns or runs a business of any type or size to understand the role of technology in business growth. Your competition is grappling with the same issues as you are, and it’s only a matter of time to see which businesses not just thrive, but survive. Think back just 20 years ago. No Internet, no cell phones, no email, no cloud. Every decade our overall rate of technology progress is doubling. That means in the 21st century we won’t experience 100 years of progress – it will be more like 20,000 years of progress! A generation ago we could not have imagined doing business on the scale we do today. There’s no question that every business, large and small, has benefited from technology. However, along with all this innovation comes complexity. Over the past few decades as businesses moved more and more of their operations into the digital space, IT started to become a critical component. Many turned to the handful of big vendors that provided IT solutions. Typically, each solution was tailor made for each client, and as the years went on each unique IT set-up become more complicated. The result? Businesses ended up with giant layers of proprietary, hard-to-maintain and expensive IT infrastructure. New technologies have changed the game, and many of the tasks that required complex solutions can now be automated by simpler and more cost-effective IT. As an employer, you definitely want to take advantage of the efficiency and productivity gains that come with new technology, but it’s not always obvious in which direction you should go. Today’s employees expect technology that is fast, reliable and easy to use from anywhere, including their own mobile devices. Are ready to support a remote working environment? Finding the right talent often means hiring people in different states and or even different countries. Are you up to speed on the latest business communication options? The cloud is an excellent way to facilitate easy access to data and applications from anywhere, and can improve everything from data storage to faster processing to lowering costs. Have you explored the best cloud migration strategy for your company? The cloud is an excellent way to facilitate easy access to data from anywhere, improving everything from data storage to faster processing to lower costs. Today’s IT teams are having a huge challenge trying to stay on top of fast changing technology. Even just trying to keep up with day-to-day IT support is a challenge, let alone maintain expertise in every single new technology that emerges. One of the most challenging areas is trying to keep up with the never-ending battle surrounding IT security. Hardly a week goes by when we don’t hear of a major data breach or ransomware attack on a big company such as the newsworthy Equifax hack. Around the world, cyber-attacks on businesses are getting more powerful and harder to stop. But don’t think for a minute that hackers are only targeting big companies. 43 percent of cyber-attacks are aimed at small businesses. In fact, more than half of SMBs in the US reported having a data breach in 2017, and the average cost of these breaches is much higher than most can afford and still remain in business. 60% of small companies go out of business within six months of an attack. Hackers know that smaller businesses have less resources to assist with cyber security and are targeting them at an alarming rate, according to Symantec’s Internet Security Threat Report. Yet the scariest statistic is that 90% of business owners don’t feel that they are at risk of experiencing a breach from a cyber-attack. Most are woefully unprotected against cyber-attacks, data breaches and ransomware, for various reasons. The bottom line is that IT security is no longer that simple.Making this picture even more complex is the rampant use of mobile devices, with employees accessing company data from their personal devices, otherwise known as BYOD (Bring Your Own Device). While the BYOD trend is attractive to many companies, mobile security is now a huge challenge. It’s become a tricky balancing act trying to keep company data safe and secure, and yet still easily accessible from anywhere. Not too long ago, you could build a “moat” around your business by implementing endpoint security, firewalls, and protected storage. All still very important, but hackers are getting much more clever, bypassing your perimeter protection and sneaking in through other means. The rapid adoption of cloud and mobile computing has caused your perimeters to be fluid, and sometimes even nonexistent. Now your data lives all over the place, and protecting it just got a lot harder! Unless you have the proper IT security strategies in place, cyber risk is a huge threat to your business. Security now requires a layered approach, starting with employee education, a robust backup and recovery solution, and a solid business continuity plan, to name just a few fundamentals. When it comes to cyber-attacks, it’s no longer a matter of if – it’s a matter of when - and it’s why so many businesses turn to outsourced IT security to help protect their business. Hiring, training and retaining the right technology talent has become a huge challenge, and a very expensive proposition for most businesses as IT talent shortages are getting worse. Even with the right IT resources in place, many organizations are still finding that they are getting overwhelmed with day-to-day technology maintenance. Between managing a help desk, upgrading apps and devices, and making sure that company data is secure and software updates are current, the IT manager (or team, if there is one) seldom get time to attack more strategic IT initiatives. What often happens is that senior IT resources get bogged down in tactical tasks. The cost of having senior IT employees do the work of junior resources, which is very typical in smaller organizations, is akin to throwing money out the window. As an example, a senior IT manager or director may be getting paid anywhere from $80k to $130k. Even at the low end, if you’re paying an IT manager $80k a year and they’re spending a quarter of their time doing the work of a $40k a year junior technician, you’re paying double what you should for that work. Many businesses take advantage of managed IT services and support to completely take over routine management and maintenance tasks, in order to allocate their existing IT resources more effectively on strategic projects. The bottom line is that Managed Service Providers (MSPs) are very proficient at executing routine tasks such as patching software, monitoring systems and backing up data. Ntiva has mastered these and other chores across our client base, resulting in efficiencies we can pass on to each individual client. 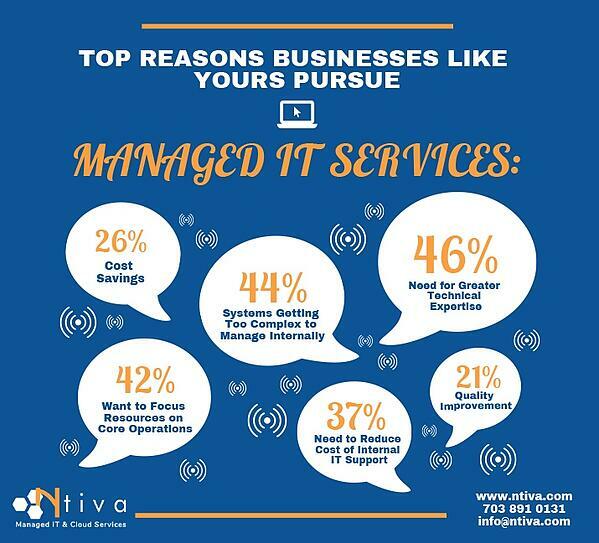 Organizations that switch to managed IT services often see dramatic savings in their IT spending. In a survey conducted by CompTIA, 46% of respondents cut their IT budget by 25% or more, with 13% of respondents cutting their budget by more than 50%. As mentioned above, much of this is due to the economies of scale that an MSP can offer, driving down the IT costs of routine management and maintenance with automation services. Investing in these automation tools just doesn’t make financial sense for most SMBs. But taking the time to do some upfront IT planning and budgeting can definitely help with cost management. Having an unbiased third party come in and audit your environment can be extremely helpful in figuring out what’s working, what’s not, and where your IT dollars would best be utilized. You can see why businesses that shift IT responsibilities to an MSP, in part or in whole, often see a huge improvement in their overall IT operational efficiencies. Without a doubt, new technologies have provided tremendous opportunities to drive greater business productivity and growth. On the other hand, it has created numerous challenges for businesses who may not have access to the level of IT expertise they need. Many businesses turn to an MSP to either completely offload IT management and maintenance, or to augment their existing in-house IT team. Hiring an MSP means far more than just managing and maintaining devices and networks! As mentioned earlier, today there is little separation between business and IT, with the latter being a vital component for business success. This has shifted the conversation to the strategic value of an MSP. In order to compete, companies need to find new ways to engage their customers digitally. Doing this requires an IT infrastructure that is reliable, available and flexible, and aligning technology strategy with business goals. To achieve real business transformation, their needs to be a focus on evaluating new applications and capabilities, not just on maintaining existing systems. When it comes to technology strategy, IT consultants are masters of their trade and experts on determining what is best for your company. They are well suited to looking at your business in an objective light, performing an accurate assessment of what is working and what is not, and helping you to plan out the most cost-effective route to meet your goals. There is a huge return on investment from offloading routine IT maintenance tasks to an MSP, and using your valuable in-house IT resources for more strategic purposes. If you don’t have that type of IT talent in-house, don’t overlook using your MSP for a more strategic purpose, even acting as your virtual CIO on a recurring basis. 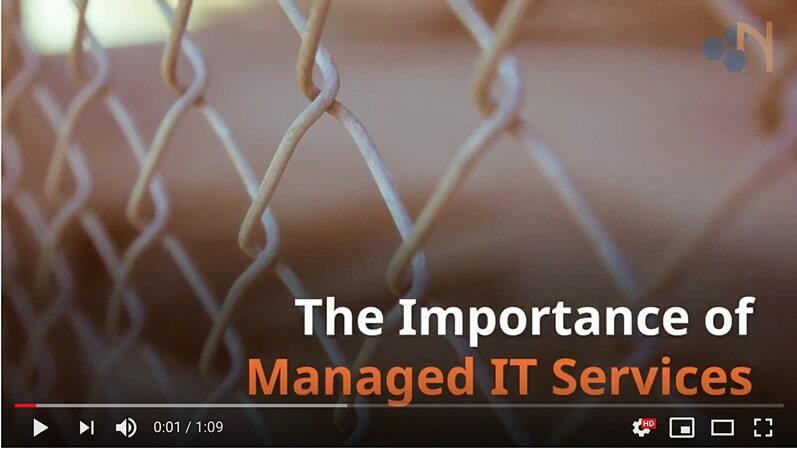 That’s where the real value of managed IT services and support comes in - taking advantage of both the wide range of technical expertise and strategic foresight that can help you drive your business forward. The day-to-day challenge of managing critical IT infrastructure plus supporting the varying needs of end-users can be overwhelming for many businesses. Many simply don’t have the time or talent in-house to manage their own IT to the level they desire. Others find their IT professionals are spending too much time dealing with repetitive tasks, with no time left to focus on using technology to improve the company. Our team of expert engineers are available to handle all of your IT needs, or act as part of your existing IT team for everything from recurring services to one-time specialty projects. Our most popular plans for companies looking to offload their day-to-day IT management can be found on our Managed IT Services Pricing page. Click below to check it out! With the right cloud solution, you can lower costs and improve service delivery – but how do you choose which cloud services are right for you? As an unbiased technology expert, Ntiva can guide you through the journey, helping you with cloud migration, deployment, integration and management. We offer public, private and hybrid cloud solutions, and work with trusted partners to deliver the reliability, redundancy and security that you expect from a cloud service. Voice communications is the lifeblood of most companies. New cloud-based communication solutions can offer extra productivity features such as instant messaging, video, team collaboration, call center features and more – typically at a much lower price than older phone systems. Mitel MiCloud, a leading Unified Communications (UC) solution, is a good example of one the many UC services we can offer. We’re often asked – what is the difference between cyber security, data security and IT security? The simple answer is that they are all very closely intertwined and all fall under the umbrella of protecting your organization. Security has gotten much more complex, and unfortunately there is no one-size-fits-all plan - it takes a layered security approach to combat never ending cyber threats in today’s environment. You can think of security as more of a journey than a destination: it’s important to stay on top of new developments. Our team of experts can partner with you to help identify, quantify and reduce your risk, including helping you maintain compliance with specific industry regulations. Ntiva delivers strategic IT consulting services to organizations who are looking for technology guidance on a variety of topics. This may range from risk management to IT budget planning, disaster recovery planning, cloud strategy, compliance audits, and more. Whether you need help with a one-time project, or IT leadership on an ongoing basis with our Virtual CIO services, Ntiva will work in close partnership with your current executive team and IT staff to ensure you accomplish your goals. Our team of experts can partner with you to help identify, quantify and reduce your risk, including helping you maintain compliance with specific industry regulations.